This chapter is an overview of the diversity of the region in regard to linguistic groups. Local language is a key to mapping the diversity of Middle Eastern identities. While linguistic boundaries do not always obey national boundaries (in the Middle East, more often, they do not), they provide a picture of the diversity of the cultural landscape. Cultural identity and the communities that shape how individuals are seen in greater society go beyond static definitions of culture, ethnicity or nationality, and can easily be oversimplified in an introductory text, such as this one. Focusing on the “cultures” of the Middle East can be quite problematic because boundaries can be hard to define. Further, the notion of a static “culture” notion of culture can lead to categorizations of communities according to “characteristics” that can be misleading (Rogoff,2003). The focus on history is not to relegate these communities to the past, but to incorporate the element of time and to explore an important aspect of culture, language, which exhibits stability and change. Languages convey information about long histories more than national borders do. When such differences are used as grounds for discrimination, or become politicized, it can be challenging to get a straight answer from anyone about the status of a language. Language is profoundly and universally tied to cultural identity and social experience. Be cognizant of this factor as you continue to learn about the languages of the Middle East, and their connections (and dissonances) with national identity; particularly when a language is overtly tied to citizenship and cultural loyalty in the popular culture. The many languages that exist in the region can be grouped into three large linguistic categories. They are listed below, and we have provided them in chart form below. 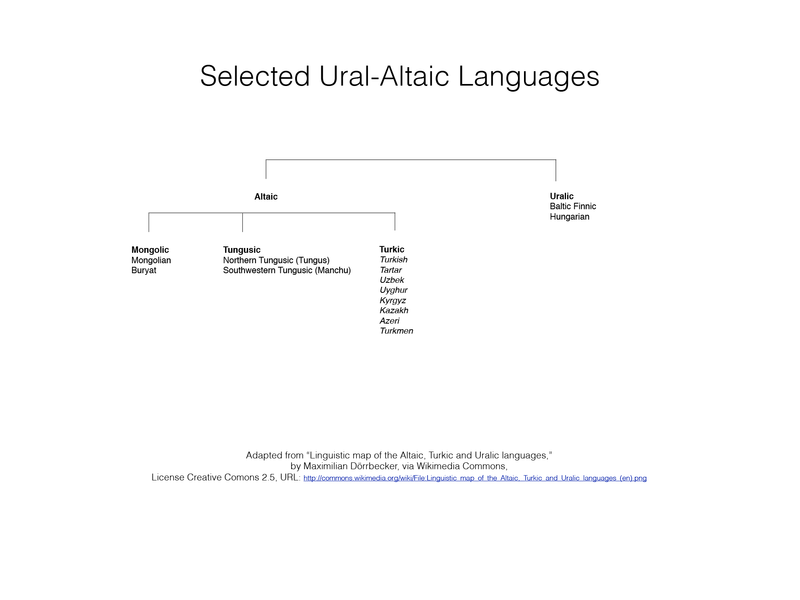 Ural-Altaic Languages (Turkish and other Turkic languages, such as Uzbek, Kyrgyz, and Azeri/Azerbaijani). Semitic languages are important due to the histories of the Ancient Semitic civilizations, such as Sumeria, the Hebrew communities, Arab communities and Aramaic-speaking communities of today. Abraham was an Akkadian speaker, and Jesus’s native tongue was Aramaic. Aramaic is also one of the important languages of the Talmud, or the scriptural exegesis made by prominent Jewish scholars regarding the Torah. Hebrew is the traditional language of the Jewish people, and has become a living language again in Israel, since the late 19th century. It is the language of the central Jewish scripture, the Torah. Arabic is another other majorly influential Semitic language which we will cover in the next section. Persian is the main language spoken in Iran, Afghanistan, and Tajikistan. 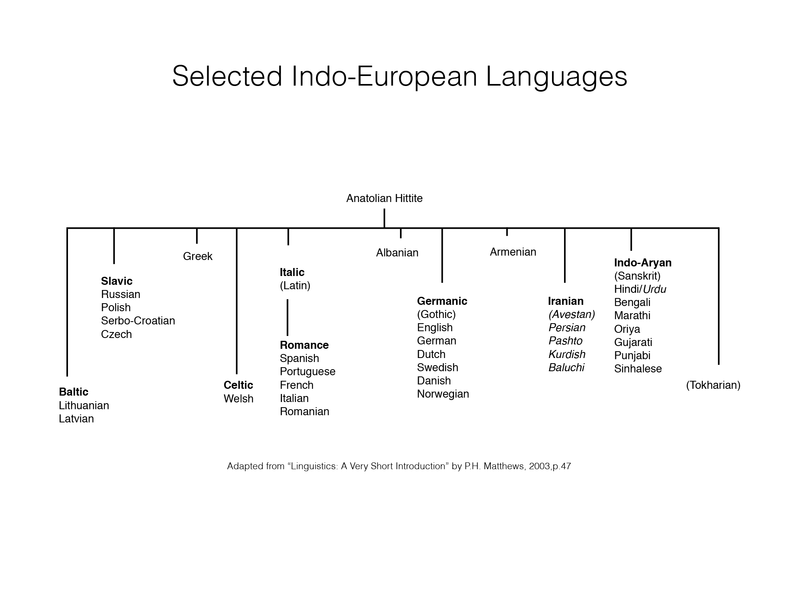 Being an Indo-Iranian language, and part of the Indo-European family of languages, it is much closer to English in structure than the Semitic or Turkic languages. Thus, it takes less time for a native English speaker to learn Persian than to learn Arabic, Hebrew or Turkish. Persian/Iranian words continue to play a major role in the languages of the Middle East and beyond. Many of the cultural practices of the Persians are reflected in modern words. Horsemanship words, for example, often reflect Persian origins. The word for stable in Persian in estabel. The word diwan, meaning collection of high literature, is still an important word in the Middle East. Practices from Achaemenian, Sassanian and other Persian civilizations show up in modern concepts of literature, the arts and courtly life. In order to put the language “families” in context, consider Persian in relation to European languages – they are both part of the same linguistic “family tree” (see chart, below). It is not hard to deduce that English and Persian have a common ancestor. One of the ways linguists determine a language’s origins is by looking at “old words”; that is, words which represent concepts with a long history in the community. The words for family members are analyzed in this regard, as family experience is a fundamental human experience. The word “daughter” in English reveals through its spelling a previous pronunciation in which the “gh” was pronounced something like the “ch” in German. German retains this pronunciation in its word for daughter: tochter. The Dutch word is dokhter. The word in Persian is also dokhter. Mother is Madar in Persian, Father is Padar, Brother is Biradar. These are pieces of evidence that English, German, Dutch and Persian share a common ancestor, and thus, common cultural community from the distant past. 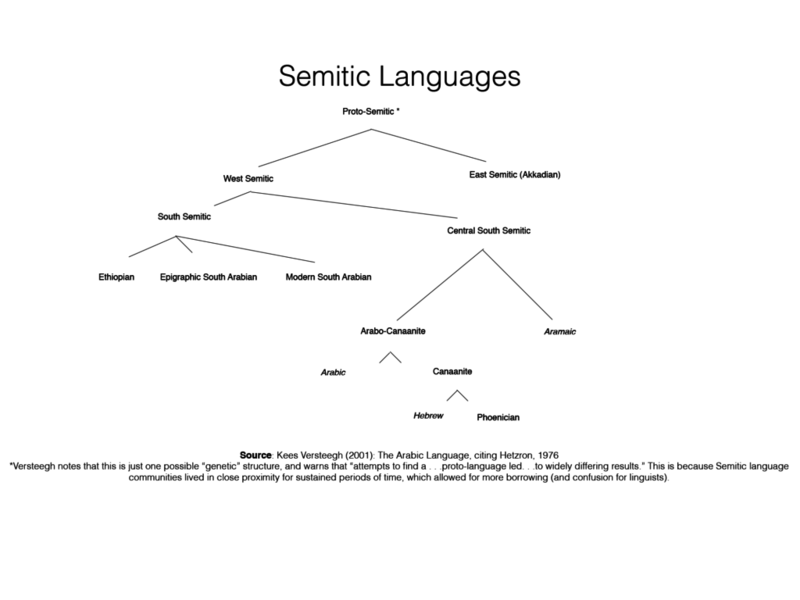 This chart shows the Semitic languages, which constitute one of the three major linguistics roots of Middle Eastern languages. The Indo-European languages constitute one of the three major linguistics roots of Middle Eastern languages. The three major language groups are: Semitic, Indo-Iranian, and Ural-Altaic. Living languages of the Middle East are in italics. Image by Melinda McClimans, All Rights Reserved. 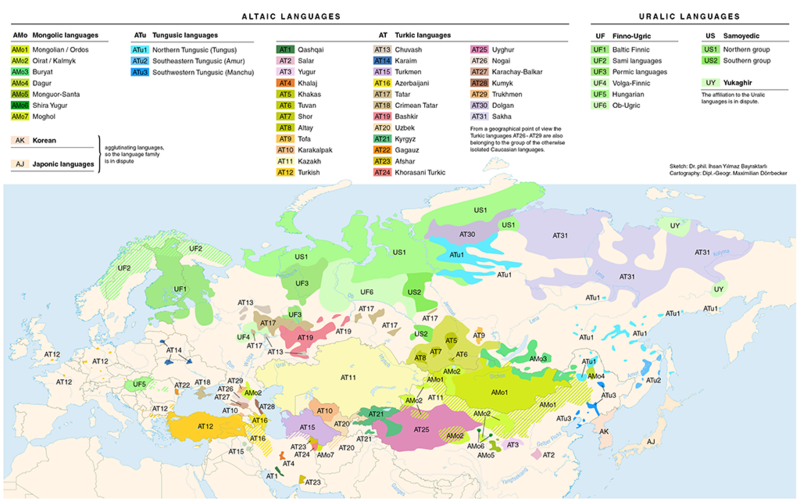 The Ural-Altaic languages constitute one of the three major linguistics roots of Middle Eastern languages. The three major language groups are: Semitic, Indo-Iranian, and Ural-Altaic. Living languages of the Middle East are in italics. Image by Melinda McClimans, All Rights Reserved. Turkic languages include modern Turkish, and are an additional highly influential group in the region. Rooted in nomadic cultures, Turkic-language-speaking communities migrated westward in waves from Central Asia, over the centuries. These groups made an impact in world history in numerous ways. Mamluks, Seljuks and later Ottoman civilizations enjoyed some of the highest levels of culture, medicine and science in the Middle East region and perhaps the world. These and other Turkic communities took on the leadership of Islamic expansion after the Arabs, eventually taking Constantinople. They made numerous significant contributions to the past and current cultural landscape of the region. The expanse over which Turkic languages spread is remarkable (see map, below), reflecting the nomadic migrations of these communities throughout history.